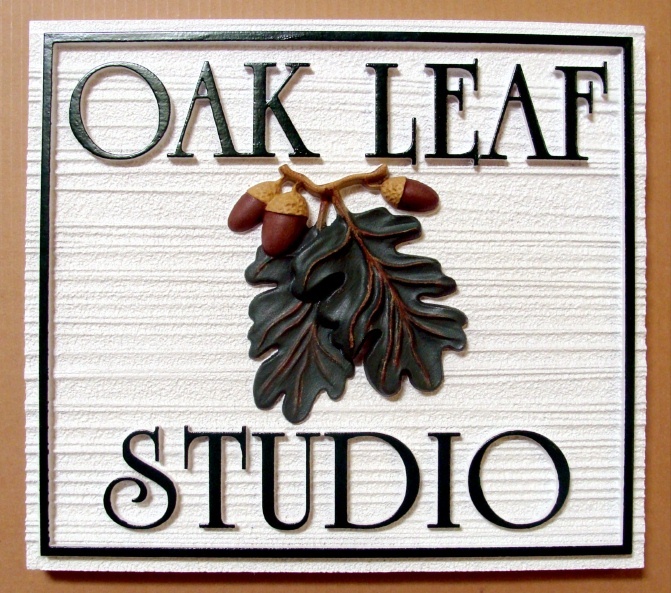 Above is an all-weather High Density Urethane sign for "Oak Leaf Studio." The interior background of this sign has been lightly sandblasted to achieve a sandstone texture. The sign features a hand-painted, 3-D art carving of oak leaves and acorns. The lettering and double borders are carved in 2.5-D raised (flat relief). The body of the sign, including text and borders are painted with long-lasting automotive-grade enamels and the carved 3-D art is hand-painted. The entire sign is clear-coated twice with highest quality clear-coat, making the sign ready for either indoor or outdoor use.